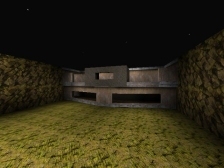 QuakeWorld TeamFortress duel, sniper war and capture the flag map. Red and Blue team - one player per team: Fight in a small arena. 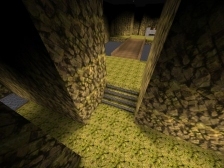 Yellow and Green team - any number of players: Snipers play sniper war in a small 2fort while all other classes play in a small CTF map, take the enemy flag from their base and capture at your flag point for 5 frags. 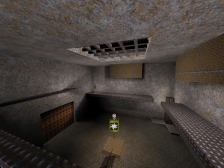 This map is designed for individual frags for the dueling teams and the player who captures the flag gets 5 frags and not the whole team. Extract amth1.bsp into the fortress\maps directory. Convert extended ASCII in Quake's qconsole.log into readable plain text. Source included (GPL). 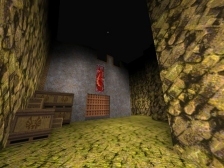 From a list of maps, MapEx collects all the required model and sound files from the quake directory and compresses them either individually or together. Send single or many rcon commands to a QuakeWorld server. The config for SE2 (203.96.92.69:27500), includes all server settings and modified ThunderVote map voting system. Requires extra files such as server binary and PAK files, see the readme for more details. SE2 uses OZTF 1.45. How to make locs with heaps of positions real easy (view the how to demo). /bind x "say .mark -r- flag room"
/bind x "say .mark -r- way to flag room"
Obviously change the names in the example and don't call every room "flag room" with the one beside it "way to flag room". Make the names of the positions understandable to everyone. It's used for the team and not useful if only you know where you're talking about. The more positions in a loc the better.